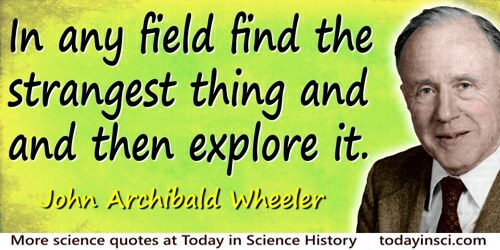 American physicist who helped develop the theory of nuclear fission. He coined the terms black hole and wormhole used in astronomy. His contributions to other subjects include fundamental work in nuclear structure, scattering theory, relativity and geometrodynamics. The Nobel prize-winning physicist, Richard Feynman, was one of his students. In any field find the strangest thing and then explore it. Quoted in P.C.W. Davies, God and the New Physics (1984), 39, from J.A. Wheeler, 'Genesis and observership', Foundational Problems in the Special Science (1977), 39. 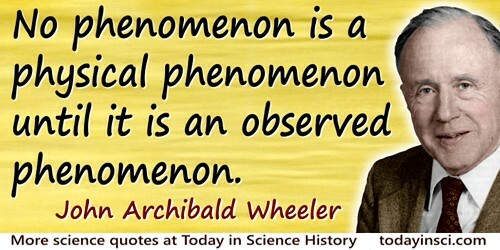 No phenomenon is a physical phenomenon until it is an observed phenomenon. Quoted in Robert J. Scully, The Demon and the Quantum (2007), 191. No theory of physics that deals only with physics will ever explain physics. I believe that as we go on trying to understand the universe, we are at the same time trying to understand man. In The Intellectual Digest (June 1973), as quoted and cited in Mark Chandos, 'Philosophical Essay: Story Theory", Kosmoautikon: Exodus From Sapiens (2015). Of all heroes, Spinoza was Einstein’s greatest. No one expressed more strongly than he a belief in the harmony, the beauty, and most of all the ultimate comprehensibility of nature. In article, 'Hermann Weyl and the Unity of Knowledge', American Scientist (Jul-Aug 1986), 74, 372. In the online pdf on the website weylmann.com, p. 26. 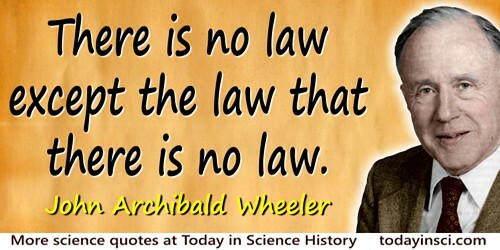 The laws of physics must provide a mechanism for the universe to come into being. As restated in Alan Lindsay Mackay, A Dictionary of Scientific Quotations (1991), 260. Compare with P.C.W. Davies, God and the New Physics (1984), 39, for quotation footnoted from J.A. Wheeler, 'Genesis and observership', Foundational Problems in the Special Science (1977), 39. In 'Gravity quantized? ', Scientific American (Sep 1992), 267, No. 3, 18-19. As quoted and cited in Clifford A. Pickover, Wonders of Numbers (2003), 195. You can talk about people like Buddha, Jesus, Moses, Confucius, but the thing that convinced me that such people existed were the conversations with Bohr. About his time working with Niels Bohr in Copenhagen. 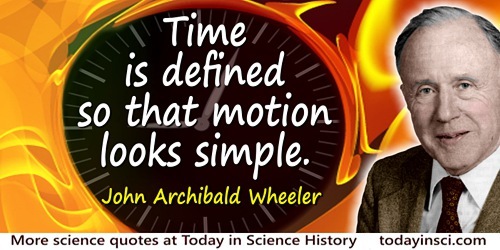 Quoted in Dennis Overbye, 'John A. Wheeler, Physicist Who Coined the Term Black Hole, Is Dead at 96', New York Times (14 Apr 2008). [The black hole] teaches us that space can be crumpled like a piece of paper into an infinitesimal dot, that time can be extinguished like a blown-out flame, and that the laws of physics that we regard as “sacred,” as immutable, are anything but. In John A. Wheeler and Kenneth Ford, Geons, Black Holes & Quantum Foam: A Life in Physics. Quoted in Dennis Overbye, 'John A. Wheeler, Physicist Who Coined the Term Black Hole, Is Dead at 96', New York Times (14 Apr 2008). 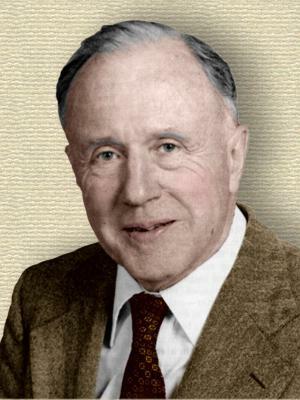 For me, [John Wheeler] was the last Titan, the only physics superhero still standing. Some people think Wheeler’s gotten crazy in his later years, but he’s always been crazy. 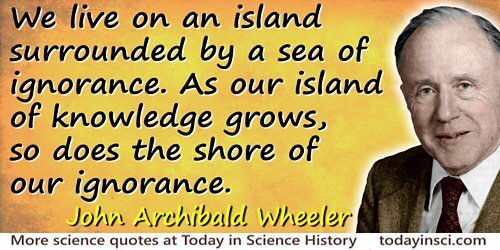 9 Jul - short biography, births, deaths and events on date of Wheeler's birth.